Archaeologists have discovered that ancient Chinese who lived 3,000 years ago mainlyused brush pens to write, rather than using sharp tools to carve characters. Sharp carving tools were once most commonly believed to be the earliest writinginstruments in China. The recent discovery marks the first time archaeologists have saidopenly that ancient Chinese actually used brushes to write. "Although today all we can see are oracle bone inscriptions, there is enough evidence nowto prove that the daily common writing tools in the Shang Dynasty (about 1600 BC to 1046BC) were brushes instead of sharp carving tools," said Tang Jigen, head of the AnyangStation of the Institute of Archaeology at the Chinese Academy of Social Sciences, duringan interview with Xinhua on Wednesday. The archaeological discovery of oracle bones and oracle bone script at Yinxu, the ancientruins discovered near Anyang in Henan Province, resulted in the identification of theearliest known Chinese writing. The archaeological remnants at Yinxu are the remains ofthe ancient city of Yin, the last capital of China's Shang Dynasty. 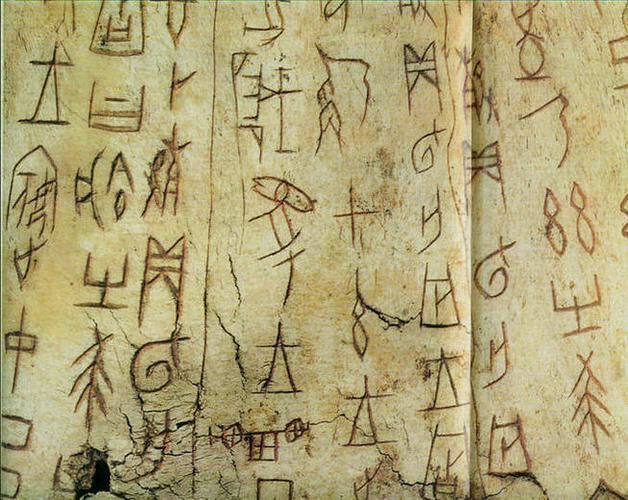 Ancient Chinese characters carved on oracle bones were used to record divination inancient China. Tang said that certain characters in the oracle bone scripts indicated that people in the lateShang mainly used brush pens to write. "'Book' in oracle bone inscription is the pattern of bamboo strips held together by strings,"Tang said. "Strips of bamboo clustered with strings made a bamboo slip, and the existenceof a bamboo slip indicates the presence of brush-written characters on it." "Also, the characters for "history" and "pen" deciphered in oracle bone script both look likea hand holding a brush pen instead of pinching a sharp tool -- a knife, for example," Tangadded. Archaeologists have unearthed a jade tablet with brush-written calligraphy from the tombsof nobles at the Yinxu site, according to Tang. Some characters on the oracle bones were even written by brush, not carved, Tang said. "Not only on oracle bones, but traces of brush-written characters were also found onbronze ware, jade, and ceramics discovered at Yinxu," said Tang. Tang noted that rubbings of bronze ware inscriptions show characters that bear traces ofbrush writing. For example, the Chinese characters for "good" and "trip" both had a roundshape which could only be written with a brush pen, and the character for "father"contained strokes written by brush. "There is so much evidence to prove that people in late Shang most commonly used brushpens to write. But brush-written characters are hard to preserve, so only oracle bonescript has been preserved until today and remains the only written record confirming theexistence of the Shang Dynasty," Tang said.